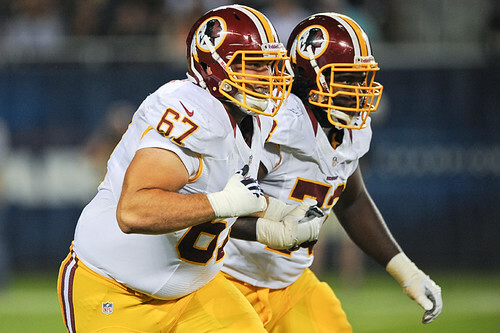 When the Washington Redskins traveled to Chicago to face the Bears last week, it was more than just another mundane preseason contest for rookie guard Adam Gettis. The 23-year-old grew up near Chicago and went to nearby Lincoln-Way High School, so this was a chance for all of his friends and family to see him in action for the first time since he became an NFL player — which might explain why Gettis said he needed 50 tickets for the Redskins-Bears game. Because the offensive line has already been decimated by injuries to right tackle Jammal Brown and guards Chris Chester and Kory Lichtensteiger, guys like Gettis are getting valuable repetitions with the starting unit that they otherwise wouldn’t be able to experience. As if learning everything expected from an offensive lineman in this offense isn’t enough, Gettis and fellow rookie Josh LeRibeus also found themselves out there with the special team unit against Chicago. The duo formed a wedge on at least two kick returns against the Bears, so I was interested to hear what that was like for a player I was guessing hadn’t been asked to do that in a while. The Redskins used a fifth-round pick (No. 141 overall) in the 2012 NFL Draft to select Gettis out of Iowa, a college program that just so happens to utilize a zone-blocking scheme. While he might be a little undersized for some offenses, his head coach in Washington was pleased to land him. And if Shanahan is worried about missing 60 percent of his projected starting offensive line, he isn’t admitting it to us. Instead, he prefers to focus on the positive — namely giving young guys a chance to show what they’re made of. While Gettis believes there’s plenty of work for him to do, some of his teammates are already seeing something special out of him.